Some perylene greens and green golds—ignore the Greenish Umber at the bottom, it should be compared with umbers. Note that I can get very dark coverage with the Schmincke Pan watercolor perylene green, it’s just that I didn’t make a point of picking up a lot of paint. Typically it’s the Schmincke Pan perylene green that I’ve been using in the past 12 months or so, because I’ve been using my pans a lot. I picked up the other tubes a while back to make comparisons. 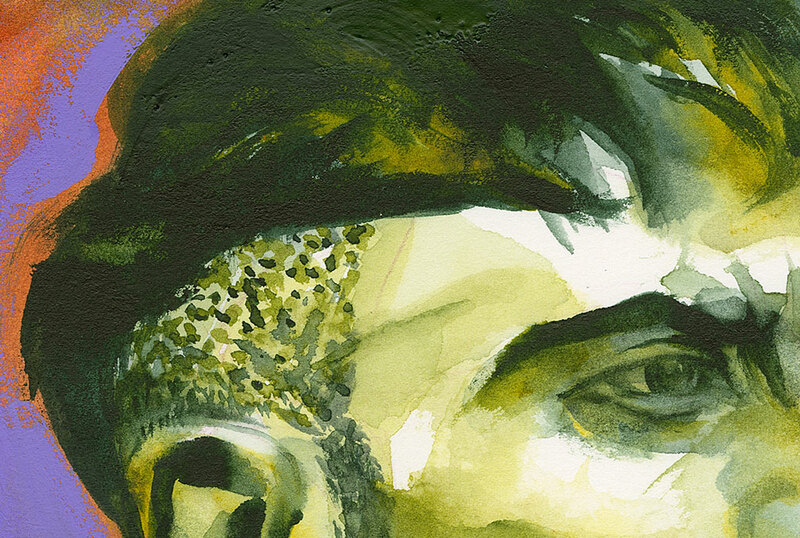 The Holbein is more of a dark pine forest green than the other two perylene greens. Less smokey. Tuesday I met up with a couple artist friends for lunch and afterwards we trekked across the street to Wet Paint, each with some art supply on our list. For me I was picking up some white gouache to test. Funny how that goes, I ended up sorting my paints when I got home and instead of testing the white gouache brands (something I had been planning) I looked at my Perylene Green and Green Gold paints. My look was not exhaustive, but I put them here so you can have a peek. Depending on how you have your monitor adjusted you might not be able to see accurately the differences that I see. You can see some notes on my swatches and also see my comments in the caption accompanying each chart. My favorites right now are the Schmincke pans. Partly it’s just that I have been using these pans a lot in the past year. 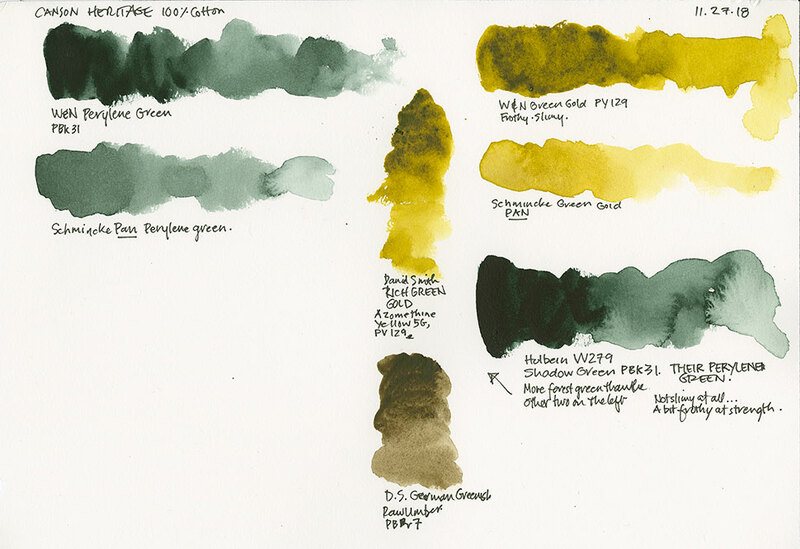 I purchased the Winsor & Newton tube colors because I wanted to compare it. I’ve been using Winsor & Newton in my sealed palette of fresh, soft paint, because it seems to be lasting longer that way without growing anything than the other brands I’ve used. I still in general prefer Daniel Smith paints, but that’s because I let them dry on my palette or make my own pans containing the dried tube paint because they rewet so nicely. But the last few times I’ve kept them fresh in a sealed palette things got moldy. I’ve been running my current grouping of fresh Winsor & Newton tube paints for over 8 months without any issues (adding new paint as necessary. I haven’t made exhaustive tests on the two brands for the mold issue, I’m just enjoying not worrying about the Winsor & Newton for now. I had to go to another store to pick up some brands of white gouache that Wet Paint doesn’t carry. (Yep they can’t carry everything). 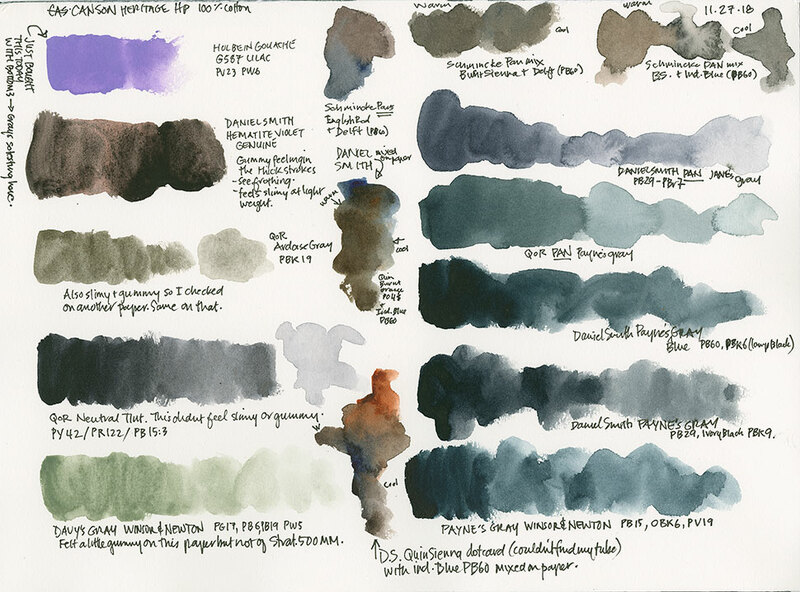 But while I was shopping elsewhere I found that I was oddly attracted to the different gray watercolors. I knew I had a lot of them at home—I keep them around for students to work with in class. I bought a couple more and took them home and made a chart as well. I know that lots of painters love to have premixed tubes of gray on their palettes for convenience and speed. I prefer to mix my neutrals using a complementary pair or a triad already found in the painting, on the fly, skewing the mix warm or cool as needed. I think mixing neutrals as needed makes the paintings much richer—but full disclosure, mixing Indanthrone Blue (PB60) with Burnt Sienna (typically PR101, but it depends on the brand) yields the perfect Malamute Gray. I don’t think I need to say anything more on that—except that I really don’t like the green cast common in a lot of the mixed neutrals and Payne’s Gray offerings. 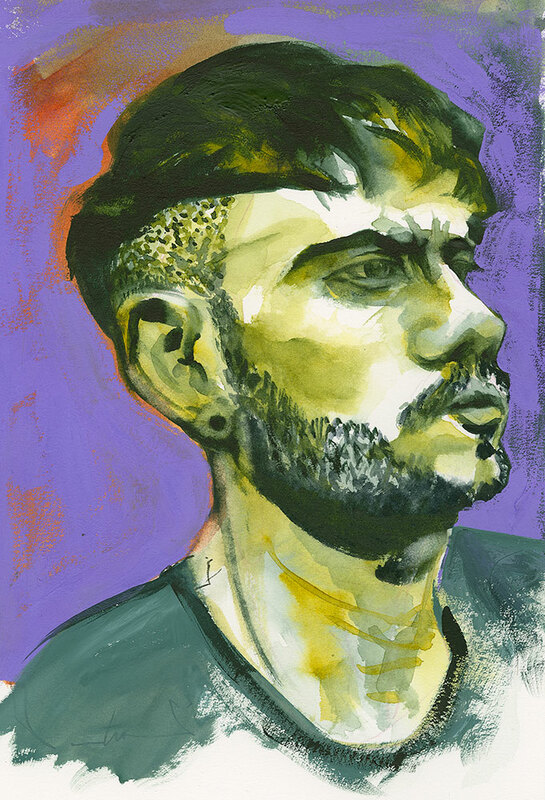 Quick magenta color pencil sketch with watercolor (Yellow Green Gold and Perylene Green watercolor; Holbein Lilac Gouache, Daniel Smith Burnt Scarlet and Holbein Primary White gouache) on Canson Heritage 100 percent cotton 140 lb. Hot Press Watercolor paper. With charts like this to start discussion I then encourage the students to use the different paints I’ve brought in to create their own charts. In this way they can start to learn their own preferences. As often happens when I make swatches I end up with a bunch of paint on my palette begging to be used. 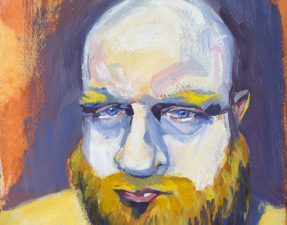 And I obliged by painting this quick portrait. In part I wanted to use up the green paint. But also I wanted to test the Canson Heritage Watercolor paper with actual painting. While I was picking up the extra brands of gouache I happened to see blocks of this paper and picked up one to test. It didn’t say what type of sizing it contained on the packaging. These days that’s usually a sign that it isn’t gelatin based. I prefer gelatin based sizing on my watercolor paper. I find that in general the washes move more smoothly on a gelatin sized paper. Sure enough, when I got home and looked up this paper I found that it uses non-animal sizing. I’m not sure if this means they are using vegetable/starch sizing or if they have invented something new that does the trick. What I can tell you is that all the vegetable/starch sized papers I’ve used are pretty draggy and I don’t like them. Whatever they’ve put on the Canson Heritage is intriguing and I’m looking forward to working more on this paper to test what it will do. 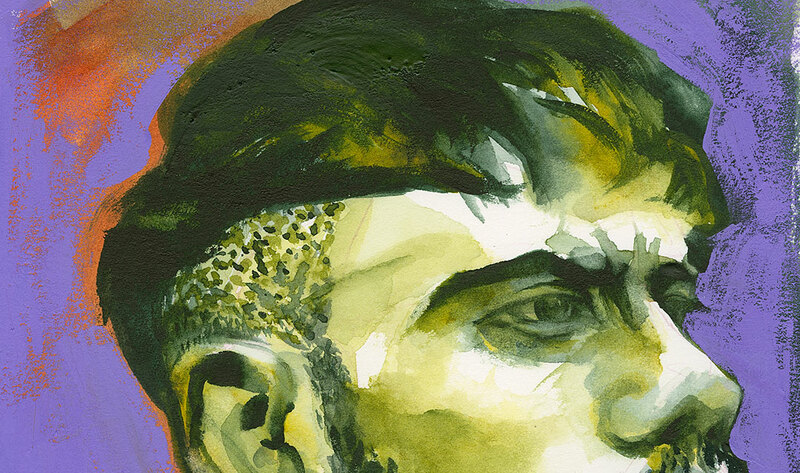 Detail of today’s portrait, showing opacity of watercolor, some lifting out, and the gouache and watercolor background. I found that the brush pen (you’ll see examples of that in a future post as I haven’t scanned those) was very draggy on this paper. That’s usually a deal breaker for me. But it was the end of a day and I had to get my sketching done so I kept going and was pleasantly surprised with how the paint worked in a loose way over brush pen. Then I sketched the green portrait you see here because I wanted to test how it blended and lifted off. I was quite pleased with how tough the paper was when I went to lift colors off. I wasn’t using my stiff lifting brush so I didn’t get back to white in most places, but I found if you timed it right (and of course depending on the staining qualities of the pigment you’re using), you can life quite well on this paper. If you are looking for a non-animal sizing paper you might want to check this paper out. I’ll keep you posted as I work my way through my block of paper. 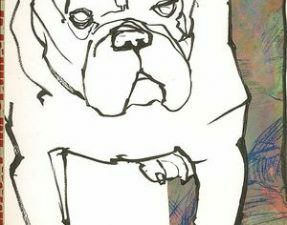 Animals Art Backstory creativity Dogs Hiatus 2014 Notan Random Thoughts Roz Stendahl Sketchbook Skool Sketching Visual Journaling Why Draw? I love your posts and just this morning thought that it has been a long time since I have seen one. I checked your site and realized that somehow I had become unsubscribed. Just thought I would let you know in case your site is somehow unsubscribing, or omitting people. In any case, I have re-subscribed and once again look forward to your regular visits in my inbox. I missed you! Thanks for reading and thanks for you patience. Basically, unless I’ve died or had a major accident you should expect there will be 2 to three posts a week. Cheers. I would like to receive your newsletters. You can subscribe by using the form at the bottom of any of my blog’s pages, however, I don’t know when the issue will be resolved (as I mention in the post link I have provided. Thanks for your interest. Thanks you for your reply Roz, and the explanation. I hope your difficulties with this are resolved soon . All the best. Roz, what is the difference between gelatin based sizing or starch sizing? I bought a block of watercolour paper for a project I’ve got planned for the new year, exploring watercolours. The paper is Fabriano Studio Watercolor – Cold Press – 25% Cotton – 140 lbs. It tells me on the back that it’s made of a mix of cotton (25%) and lignin free cellulose. I bought it because it was on sale and I figure I might as well start somewhere. I’m wondering how it might fit into the dichotomy you’ve referred to. There’s no reference to sizing on the cover. Stephen, the difference is clear in the names—gelatin sizing is made from gelatin and as such is an animal product. Starch or vegetable sizing is made from plant sources. Every artist is different but the obvious reason for choosing starch/vegetable sizing is if you are a vegetarian. Gelatin sizing was what Fabriano first used (hundreds of years ago; and for hundreds of years). They switched to starch/vegetable sizing in/on their papers about 20 years ago, including their top of the line Artistico watercolor paper. Obviously the paper manufacturers like to try to mimic the feel of the gelatin sizing but that isn’t really possible. Gelatin is gelatin. The paper you purchased is a student grade paper. I think they rate it as “professional” based on the name, but I consider its working capabilities and characteristics to be student grade. I would like you to start working on artist grade paper whenever you can so that you can learn to handle your paints on a quality paper and improve your skills quickly. Whether the artist grade paper you elect to use has a gelatin or a starch/vegetable sizing is going to be a matter of choice in how you ultimately come to work, but you need the quality paper as soon as budget allows. I would use this paper for quick studies and some daily practice type issues (but not media practice), and in fact often have pads of this in the studio. You can enter the name into my blog’s search engine and some posts should come up. 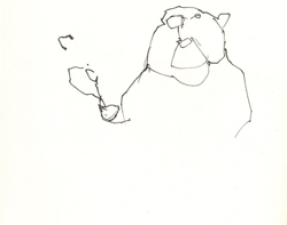 Reminder: as a Drawing Practice student you can simply write to me directly whenever you are going to purchase paper and I’ll be happy to go over possibilities with you. Thanks for the continued guidance! Rose is your autocorrect Doppelgänger! I love working on the Strathmore 500 Series Mixed Media Paper with watercolor, but remember it is not a watercolor paper, so it will take adaptation, it will work differently from watercolor paper. 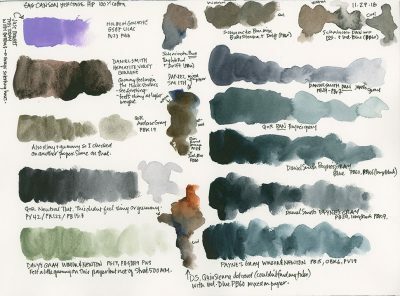 Since you’re interested in improving your watercolor handling skills I recommend that you stick with a watercolor paper for now when you’re doing the exercises in Leland’s book or other watercolor experiments. Then when you are comfortable with your watercolor skills you can paint on any paper at all. I think exploration of the palettes listed at the link on Handbook would be an excellent use of your time! Have fun. I’d like to add a note that although I have completed the ‘subscribe’ form a couple of times since your post about the difficulties you are having, I haven’t received any email updates. Along with many others, I don’t want to miss a thing! Carol, it’s good to know that you haven’t received anything, that’s an argument for moving on from this company’s mailing program. I hope we can get it resolved in the next week or so. Thanks for your patience.